3. Learning that the restoration of the Lafayette Escadrille Memorial has been fully funded and will be completed early next year. 4. 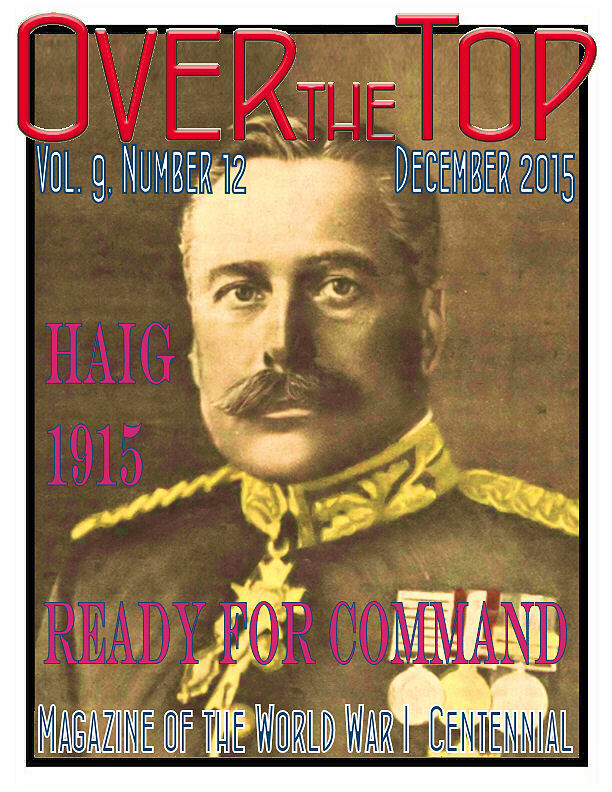 Receiving permission to republish in our November issue of Over the Top the most powerful article about the Armenian Genocide I've ever read. 7. Responding to inquiries about the war from dozens of individuals around the country and, sometimes, from people around the world who have just discovered the United States, curiously, somehow got involved in the Great War. 8. 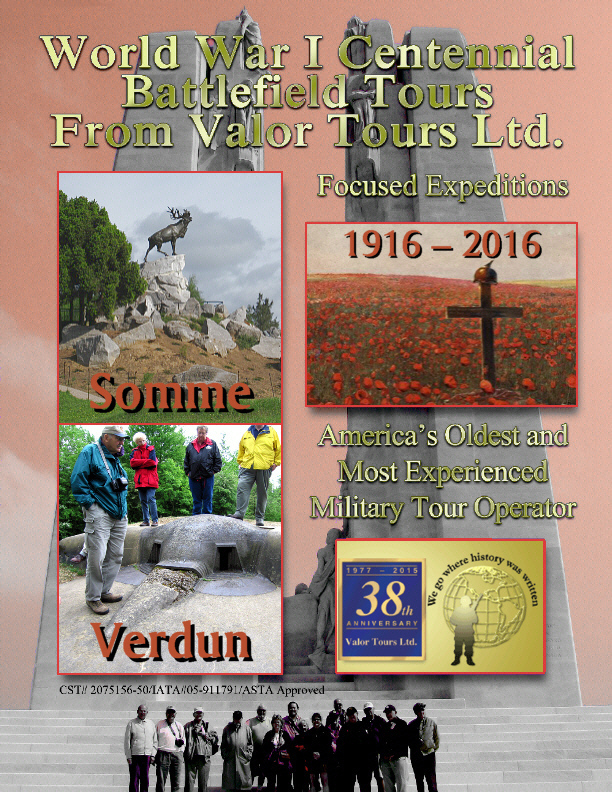 Travelling with two great groups during the year to sites of the forgotten battles of 1915 — like the Yser, Artois, and Champagne — and the battlefields of the AEF. 10. (This is my #1) Seeing the National WWI Memorial in our nation's capital approach reality. Longtime readers know that I have advocated this for years decades. The final design will be selected next month, funds will be raised, and it's going to happen. We will present full information on the international and American World War I commemorations as they become available. Both on the battlefields and on the homefronts new names would become prominent in the war in 1916. Here are biographical sketches of some of these key people. Don't miss the new movie version of Testament of Youth, the story of the best known VAD nurse from the Great War, Vera Brittain. It has a whopper of a historical error regarding the dates of the Spanish Flu, but these things happen. However, as the photo above shows, it turns out that there is another very well known VAD nurse from the war — none other than aviatrix Amelia Earhart. 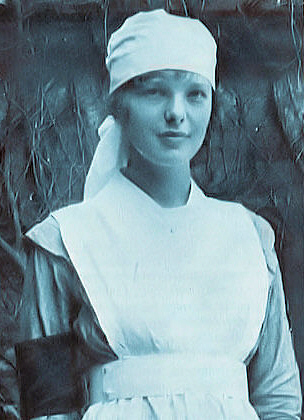 In 1917 she volunteered to serve at military hospitals in Toronto, serving through the Spanish Flu. During late 1918 she became ill, suffering from pneumonia and maxillary sinusitis. The latter problem led to chronic sinus problems, which affected her flying. Mission du Centenaire 14–18 (MdC) Executed the Agreement. 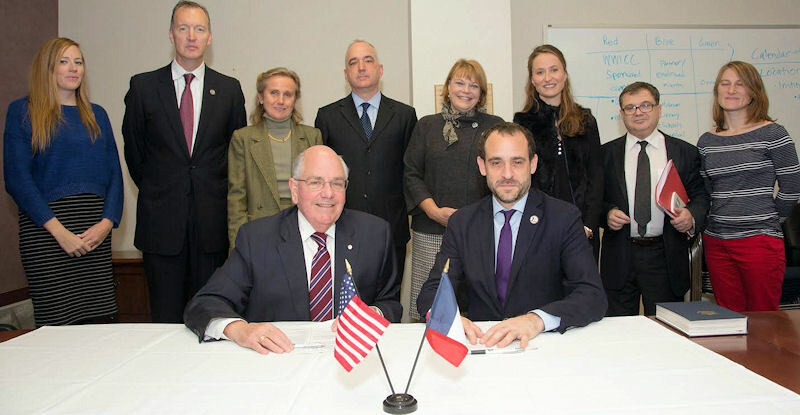 On Thursday 19 November in a ceremony at its Washington offices, the U.S. World War One Centennial Commission signed a partnership of mutual support with France�s Mission Du Centenaire 14–18. Mission Du Centenaire is the official government agency in France set up to provide public education and commemoration for the war and is the counterpart to the U.S commission. The agreement was signed by Commission Executive Director Dan Dayton and Mission Du Centenaire Director General Joseph Zimet. The agreement calls for the two organizations to share their experience, knowledge, and technical means as they prepare for the commemoration of the American intervention in World War One. Specifically, it identifies four areas for particular cooperation: 1) the identification and planning of the main events, 2) communication, digital and cultural cooperation, 3) education, and 4) remembrance tourism. Personal Remembrance, Georgia National Cemetery; Civil War Reenactors, Richmond, ME. 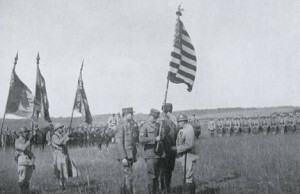 The 1914 Truce had one traumatic impact – it horrified the generals and their staffs on both sides, and they worked hard subsequently at discouraging such fraternizations. However, there were more incidents in 1915 [albeit smaller in scale] one of which was near Fromelles. Lt. Wilfred Ewart of the Scots Guards described it in his memoir, Scots Guards. It is Christmas morning. As I gaze over the parapet on the drab landscape before me, every feature, every rise or fall in the ground, every knoll, every hideous skeleton of shattered buildings, almost every tree, has its story, so consecrated forever to the memory of the English race is the Aubers Ridge opposite. . . In the foreground is a village absolutely shattered. It is scarcely possible to see the brown roofs, the stark walls, and varicolored ruins amid the trees. [A] stream runs down the middle of No Man's Land. . . And here our men meet the Germans. So soon as it grows light this morning we start peeping at each other over the top of the parapet. . . calling across to each other. And presently, at about 7.50, a German stands up openly on the parapet and waves his arms. He is followed by two in field-grey overcoats and pillbox caps. Then they come out all down the line, stand up on the parapet, wave, shout, and finally swarm forth from their trenches on either side.  . .
And so the grey and khaki figures surge towards each other as one man. . . They pat each other on the shoulder and laugh like schoolboys, and leap across the little stream for fun. And when an Englishman falls in and a Boche helps him out there is a shout of laughter that echoes back to the trenches. . . We shout" Hullo, Fritz' " "Good morning, Fritz!" " Merry Christmas'" "Happy Christmas", " How's your father? " " Come over and call", "Come and have breakfast," and the like, amid roars of laughter. Even confidences are exchanged in broken English. 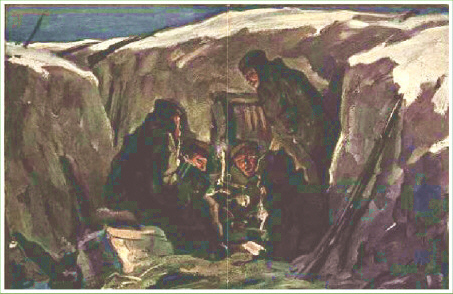 So for ten brief – all too brief – minutes there is peace and goodwill among the trenches on Christmas Day. Then from the trenches of the Ninety-fifth Bavarian Reserve Infantry Regiment two officers in black accoutrements and shiny field-boots come out, wishing to take photographs of our Tommies, and offering them cigars. Their request is refused; and presently they say: "You will have five minutes to get back to your trenches before our artillery will open fire. "And it does. And two or three men are wounded almost at once. But for twenty-four hours not a shot is fired, on either side. Here are four works that can help introduce children to the events and traditions of the war, and also gently draw their attention to learning about the past. 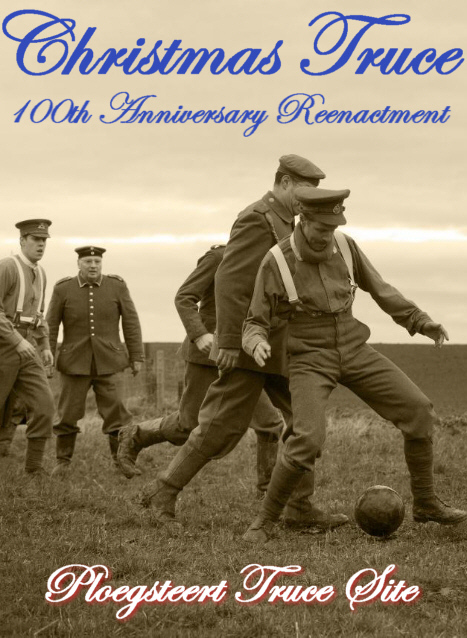 Of course, the Christmas Truce of 1914 is the most seasonal of the subjects and that is well-covered in Christmas in the Trenches, which includes a CD with soldiers singing carols. Two of the great cartoon characters, Winnie the Pooh and Snoopy, are connected to the war in different ways. In Flander's Fields discusses the origins of the famous poem and how the red poppy became the symbol of the Great War. A number of ambulance groupings had begun to emerge through the tail end of 1914 into 1915, the Harjes Formation — named after the senior partner of the Morgan-Harjes Bank in Paris, Herman Harjes — and the second, Richard Norton's Anglo-American corps. These developed separately and worked as distinct units for over a year, before eventually merging under the banner of the American Red Cross. 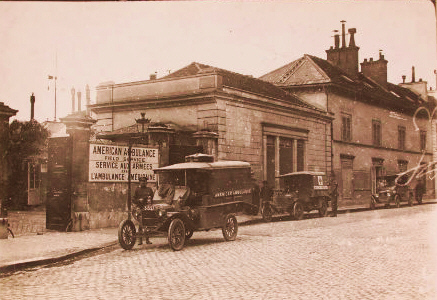 But it was a third ambulance grouping which grew out of the American Military Hospital in Paris which would grow into the largest and best organized: the American Ambulance Field Service or later simply "American Field Service," and it was it which the Stanford students had come to join. But the flag did find its way safely back to America. Two of the original members of the Stanford section who had set off from California in February 1917 brought it back there in 1918. Walter Malm, who had served as the unit's sous-chef, and Harold Blote, who worked both in France and the Balkans, carried it back to the university where it was placed in Stanford's chapel. 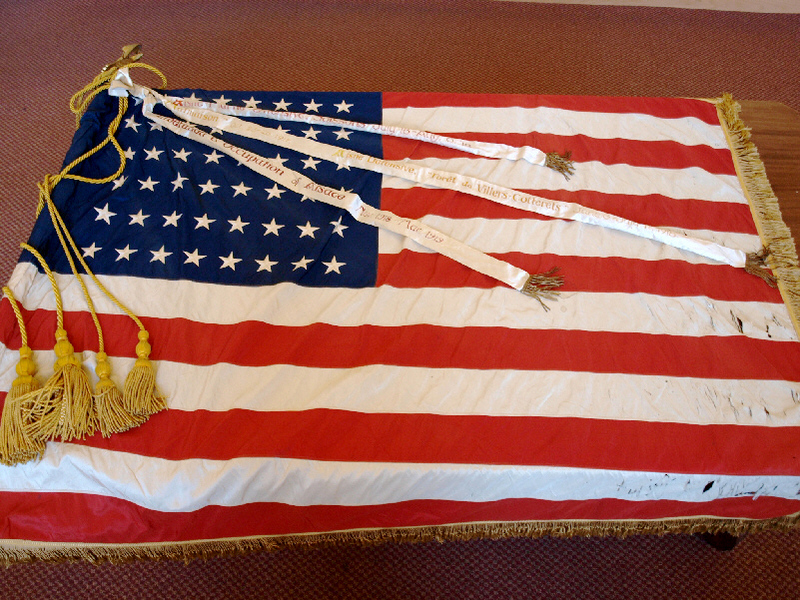 In time the flag bore not only the Croix de Guerre awarded in the summer of 1917, but also battle ribbons which showed the later service in war of the different Stanford units in France: action around the Aisne and Marne in 1917 and 1918 and the postwar occupation of the Alsace region up until March 1919. The First Flag still exists and remains at Stanford. It hung in the Stanford chapel until the early 1970s, but since that time has been stored safe — albeit not on public display —in the institution's Special Collections & University Archives department. To be continued. . .